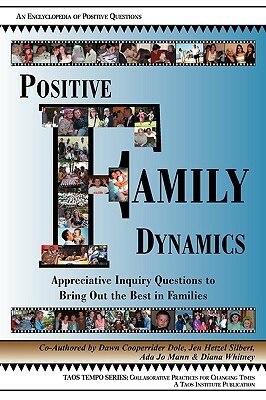 Positive Family Dynamics is a wonderful resource for parents and families members wanting to bring out the best in their families The purpose of this book is to introduce the reader to Appreciative Inquiry and its application to families. At the heart of Appreciative Inquiry is the affirmative question. This book contains 56 appreciative questions designed to increase learning, listening and positive dynamics in your family. The questions, stories and activities in this book will help you create relationships within your family which will nurture respect, love, and care. The book’s imaginative questions, exercises, and positive spirit creates a simple yet powerful method for helping families discover hidden reserves of strength and inspired opportunities for better living. They also provide powerful tools for helping all families become increasingly more appreciative, collaborative and effective in creating and shaping the futures they desire for themselves and their communities. This book is recommended for all family members — grandparents, parents, children, and beyond.